I have had this stuff on order for a long, long time. Thanks to the production problems with FUNimation's limited edition box for the anime Psycho-Pass and a vague delay to Media Blasters' Koe de Oshigoto! DVD, it was beginning to feel as though I'd never see the rest of my order. I eventually asked United Publications to part-ship a bunch of older things and they kindly obliged. The bulk of this delivery is anime. I'm not sure whether I'll like Di Gi Charat: Winter Garden yet and the official English title of smutty 90s classic Hot Space Cowboys (Aoki Ookamitachi No Densetsu) is so inelegant that it makes me cringe. It's notable that I chose the standard edition of Kamisama Kiss (Kamisama Hajimemashita). There's a lovely special edition box available, but it's targeted so strongly at a female audience that I felt there wasn't much point in me picking it up for bonus items I'd never use. I'll go into the other special editions in more detail below. Living in a country deemed unworthy of any form of legal simulcast, I've been watching One Piece lately with my partner and we've just reached a run of several flashback episodes in a row. It looks as though we'll be needing the One Piece: Season Five Voyage Five and One Piece: Season Five Voyage Six discs sooner than anticipated! There are only two volumes of manga this week and both of them are Hetalia: Axis Powers - the most recent print-on-demand issues. It's a relief that they have been able to continue publishing the series in English even with Tokyopop's closure. The final item is the US release of Dangan Ronpa: Trigger Happy Havoc. It doesn't work on the PlayStation Vita TV for some reason - even though the Japanese release did - so I can't play it yet. Oh well! I can't remember why I went for the US release over the UK version (habit?). With the recent shift towards expensive, deluxe anime releases to compensate for the market rapidly shrinking, it's interesting to see how the different anime companies present their special editions. 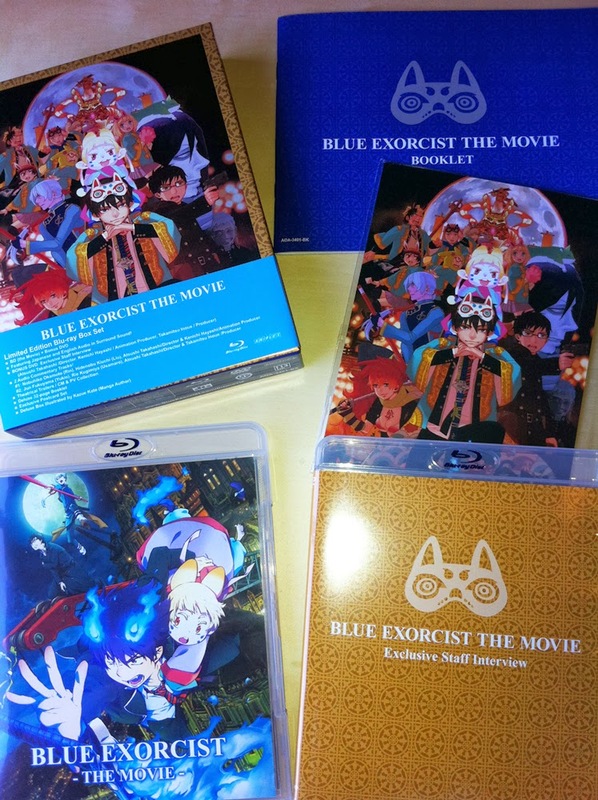 Aniplex USA's Blu-ray box set for the Blue Exorcist (Ao No Exorcist) movie was a no-brainer. It's a beautiful set with plenty of on-disc bonus material and the physical bonus items are all covered in glorious artwork. I'm still annoyed that I bought the television series on DVD instead of waiting for the Blu-ray rerelease so I wasn't going to miss out on this gorgeous set. 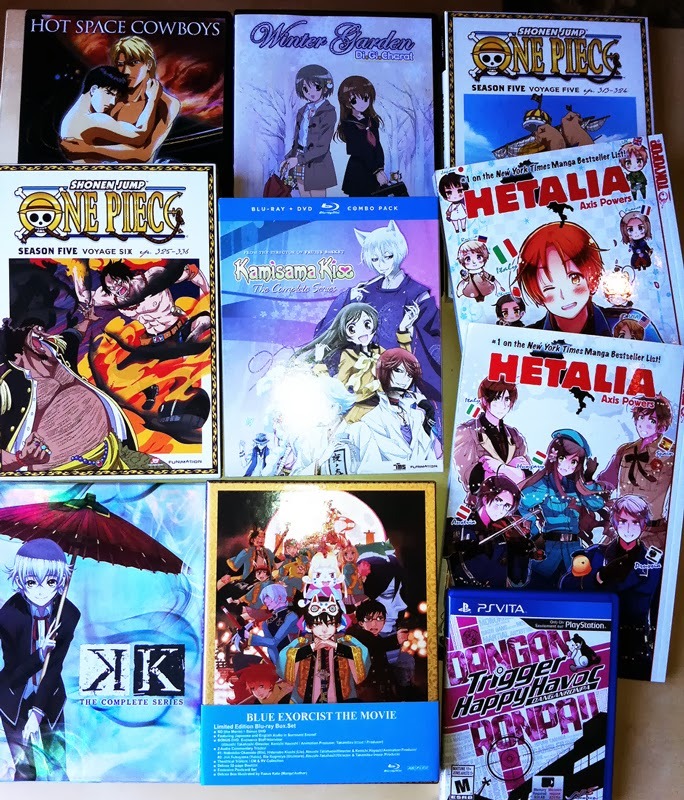 I won't be tricked by any of Aniplex USA's DVD-only releases in future. 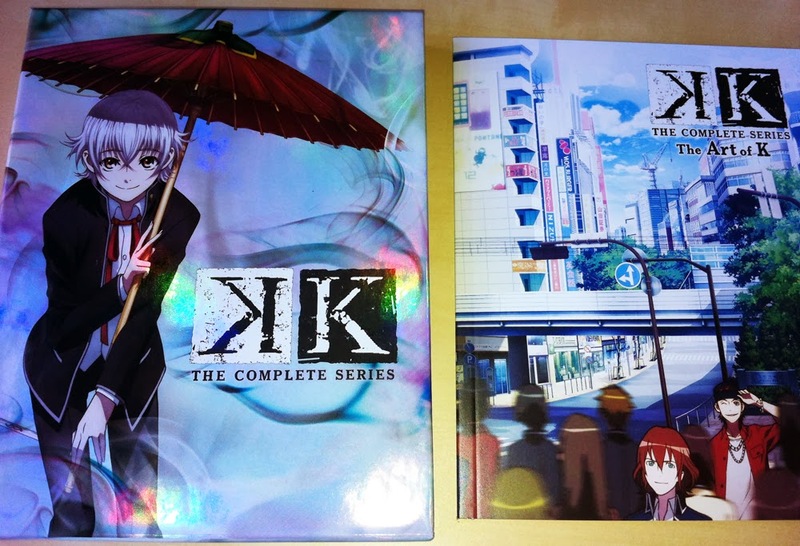 Viz Media don't usually dabble in special editions at all so I was very interested in their release of K. I watched the series when it streamed on the doomed UK simulcast service Anime On Demand and didn't want to buy a local version; I have no faith left in the UK anime industry and region A discs are more convenient for me than region B.
K came in a lovely thick chipboard box instead of the usual digipak to house the series on DVD and Blu-ray. There is also a special booklet inside the box, The Art of K, which includes character and series information. The show is definitely more appealing for the visuals than the intelligence of its plot so this set plays to its strengths nicely. It was difficult to capture how nice the box looks in a photograph, too; they've used a subtle pearlescent effect to brighten up the plain character artwork delightfully. This small touch makes the box look much more attractive in my collection. Things have been relatively quiet on the Sengoku Basara front this past week. I've tweeted about a few small updates but I'm looking forward to Wednesday evening when the Weekly Famitsu character poll results should be out. Assuming there's no big news before then, I'll save the next news roundup until I have the article ready to translate.